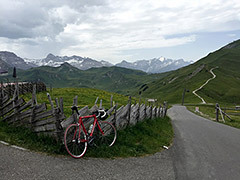 From Adelboden (1350m) and further down from Frutigen (802m) the road is fully asphalted to the top of the pass. After Adelboden you climb a little and then follow a rather flat road until a lift station, where a paved road takes off up to the right and this one you should take (the road ahead goes to Hahnenmoospass (1951m)). The road from Frutigen that bypasses Adelboden on the map below is likely all asphalted too, but I cannot confirm it. The road is not so steep, but the last ramp from the little (unnamed) pass to the Sillerebühl itself is quite steep. The road down on the other side is gravel for some way and I am not sure it is wortwhile to try that side with a road bike (but some went down on so called Trotti-bikes (no pedals) here. Other comments There is a hotel/restaurant at the top and there is a big climbing construction. The pass is not noteworthy, but it is a nice high road that could be combined with a climb to Hahnenmoospass and there is a slightly bad short gravel short-cut between these roads high up.